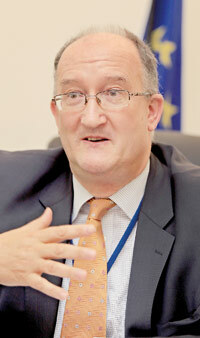 Sri Lanka has not yet made a formal application for the GSP Plus trade facility and “there is still a lot that has to be done” before it can be considered, said Ambassador and Head of Delegation to the European Union (EU) to Sri Lanka David Daly. Similarly the country has made advances on governance, human rights and reconciliation, but there remains “an awful lot” to do in transforming “the many excellent commitments” made over the past few months to progress on the ground. “If you look at significant things like the commitments made in Geneva, the commitments made in the joint resolution co-sponsored by Sri Lanka, which is a major step forward, there you see the sort of things we mean,” he said in an interview with the Sunday Times. This week, a Working Group on Governance, Rule of Law and Human Rights was inaugurated under the EU-Sri Lanka Joint Commission. The first meeting was held on Thursday. Issues related to governance, rule of law and human rights have been sticking points in Sri Lanka’s pursuit of the GSP Plus facility. Mr Daly said, accountability, in the EU’s view, was essential to upholding the whole question of the rule of law and to instilling confidence amongst all communities across Sri Lanka, within the justice system. He was responding to a question on how important an independent war crimes mechanism was to the EU. “Accountability is essential and mechanisms to ensure that are needed, and those mechanisms themselves should be credible,” he continued. “Otherwise, all of that breaks down. The Working Group meeting this week was “extremely helpful” in the GSP Plus process, the Ambassador said. “We had a good, open and frank discussion,” he averred. The “flow of good news and progress” needs to continue in Sri Lanka, he added. “It’s not possible to say at this stage, or, exactly at this moment it will happen,” he said referring to the granting of the GSP Plus. It must also be remembered that GSP Plus is a trade mechanism, he explained. It is an additional trade benefit that the EU gives to developing countries. “Amongst other implications of that are, we must do a very serious and very objective assessment of the situation in any country that is applying for GSP Plus,” he asserted. One of the things discussed at the Working Group meeting was also that Sri Lanka has been open to inviting, and has a series of standing invitations, to Special Rapporteurs from the UN system to come and look at various issues. “Those visits and their reports are very, very important for the GSP Plus as well as anything else,” he held. When a formal application is received, the European Commission, together with the External Action Service (the EU diplomatic service), has a legal obligation to make a report and assessment of the application within six months. “If our assessment is positive, then that becomes a proposal both to the 28 Governments of the member States in the Council and also to the European parliament,” he elaborated. It was crucial, therefore, for Sri Lanka to get the timing right when making a formal application for the GSP Plus. “That formal clock of six months hasn’t started yet,” the Ambassador said. The creation of the Working Group on Governance, Human Rights and Reconciliation is part of preparatory work, and of continuing dialogue. On the prohibition of fish exports from Sri Lanka to the EU on allegations of Illegal, Unreported and Unregulated (IUU) fishing, Ambassador Daly said, “there are still a number of things that need to be done” before the ban could be lifted. “We follow very closely, particularly the Directorate General for Maritime Affairs (part of the European Commission) with the Department of Aquatic Resources and Fisheries that these things are being done,” he explained.